Some users may wish to see the complete email header attached to email messages in the Mail app for Mac OS X. 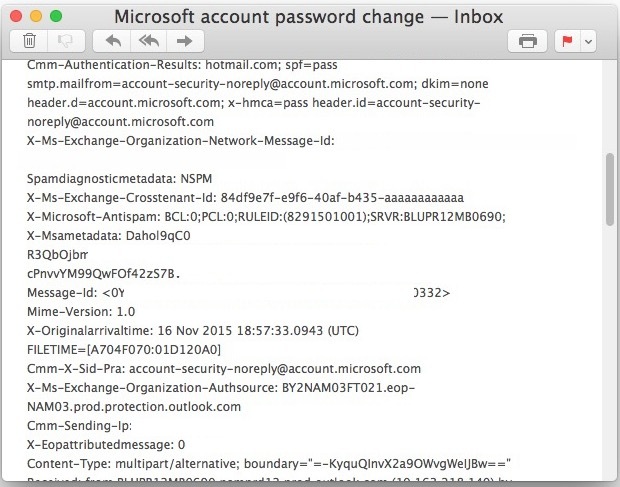 These long headers can reveal many details about the sender of an email message, including the origin mail servers and IP addresses, original arrival time, email alias details, and much more, making them a potentially valuable resource for some situations, particularly for users wishing to authenticate the validity of an email or mail message. Additionally, email header information can be very helpful for troubleshooting complicated email server issues. 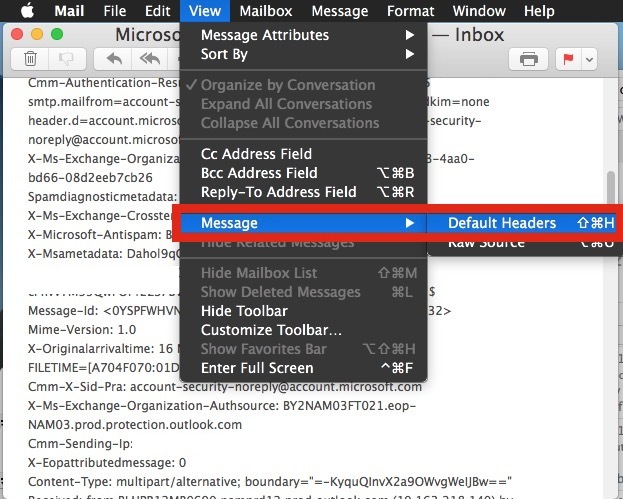 The Mail app in Mac OS X makes it easy to display the complete email headers for mail messages, we’ll show you how to show the full header, return to the default header, and a rapid access keystroke to toggle the display of full email headers off and on quickly as needed. Note this is generally best reserved for advanced users who understand how to interpret the email header data, as the average user will likely just find the email header to be unnecessary gibberish that complicates an email message. You’ll find that email headers are generally quite lengthy as they are full of various details about the mail servers involved, content types, IP addresses, and much more. Again, the complete header detail data is not really meant to be interpreted by an average email user, this is generally best for advanced users who have some experience accurately interpreting and reading the header details, which often look like a bunch of hexadecimal nonsense, dates and times, server names, and IP addresses. But, as a general rule, users can determine if a message is authentic by reviewing the header for an email message and checking to see if the header information corresponds properly with who the sender claims to be. For example, if an email claims to be from Microsoft, all relevant header information for mail servers for that message should be from “microsoft.com” or a relevant subdomain. If the sender information or claim within an email does not match up with the email header information, you may have reasonable suspicion that the sender is not who they say they are, but again, this is a generalization and that is not always true. Mac Mail users can also toggle the email header from the full complete header to the default short header, and vice versa, using Command + Shift + H from any email message. Most Mac users will find that having the full headers shown for email message is quite unnecessary, but it can be helpful to toggle the display of the complete header on temporarily sometimes to validate an email, or to help rule out problems with email servers, and then toggle the display back off to return to the regular email header view again. Using full headers is important if you are forwarding spam to, say, your ISP or bank for blocking or tracking. Thank you. I ise spamcop Which requires full headers to track spam. If an email looks suspicious, always show the header and check to verify if the domains match up. No institution will ever attempt to verify any information unsolicited via email, do not ever fall for that stuff. And yes same as what others have said, use the full header to forward a spam or phishing attempt to your ISP or bank or Apple to help fight the stuff. The problem is “All headers” isn’t really ALL headers. There are many things left out, including the “Return-Path” and the actual To, From and Date headers which are instead prettied up and shown incorrectly in the body by Apple mail. These these omitted lines can be important when determining the true source of email. Or even how to spell the sender’s name. To really see all headers you need to View -> Message -> Raw Source. This opens in a new window so you can compare the plentiful differences on your own. I just wish Apple would find a way for Mail to stop crashing. 1) Thank you for the tip! 3) I hope that readers know the difference between something /visible/ and something /existing/. The preceding comments make me doubt. Now, if Apple would only parse some of the more opaque headers. For example, once apon a time, you could tell where gmail came from, as Google would add a “Received:” header for the endpoint. But now, the first “Received:” header is always a 10.*.*. * IP, which is only the Google-end of the initial contact. I suspect the endpoint IP is encoded in the “Dkim-signature:” header, which has a bunch of what looks like b64-encoded info. Blah. Older versions of Mail were way better: they didn’t try to parse, abbreviate or reorder all headers, they allowed you to set all as your default viewing mode, and they didn’t conceal header names for recognised headers. Better, really, if you just “View Source” in contemporary releases. Spamcop (and others) will take your messages as original RFC 5322-format message attachments (message/RFC822 MIME parts). “Forward as attachment” and you needn’t mess about copy-pasting the full source; moreover, you make it a lot easier for the recipient to view and preserve accurate information, or respond to it. What I don’t see in this thread is how to forward an email with all the header info to my ISP, web host, or bank. In some cases, attachments are not allowed, so the header info has to be included in the body of the forward. This used to be no big feat in previous versions of Mail, but this is starting to feel like iTunes in its complexity! How do I do this, why is this so complicated, and will the next rollout of the app roll back this limitation to its former useful self? How can the view of headers be enabled by default? I’d like to see them without having to go to the menu option or keyboard shortcut. Figured it out – Mail > Preferences > Viewing > Show Message headers. You may want to consider adding this to your how-to. Would be very helpful for those sifting through a large number of emails. I don’t want to click FORWARD, because I would need to copy and paste all email addresses into the reply. The default Mail app reply feature includes: date and time, from sender. The “To” is you and cc if applicable, and “Subject” are maintained as is unless edited. You can adjust what is quoted, if need be in Mail Preferences.